Cinnamon is a spice or flavoring derived from the inner bark of several different trees within the genus Cinnamomum. Commercial food manufacturers use it in powder, stick, and oil forms in sweet and savory foods. Today, it is still grown in Sri Lanka and South India. Cassia is the most common cinnamon sold in North America. It is typically sweeter and more aromatic than “true cinnamon,” but it can be astringent. It is harvested from the inside bark of both young shoots and mature trees and then processed and frequently ground into a powder. Bark from trees growing at higher altitudes is considered better, with a greater oil content than those growing at lower elevations. Finely ground cinnamon is ideal for use in flavoring baked goods, although the bark oil may be used for commercial applications because it can be measured more accurately.2 In the United States especially, cinnamon mixed with sugar is commonly used to flavor apples (apple pie), cereals, and baked goods such as doughnuts, pastries, and sweet breads. Cinnamaldehyde is the most predominant compound found in cinnamon. It has anesthetic, antibacterial, anti-inflammatory, anti-ulcer and antiviral actions. As a whole, the compounds found in cinnamon are anti-inflammatory agents, antioxidants and neuroprotective. The main flavor of the bark is cinnamon oil, which contains mainly cinnamaldehyde, cinnamic acid, and cinnamic alcohol. It’s primary culinary use is as a flavoring. 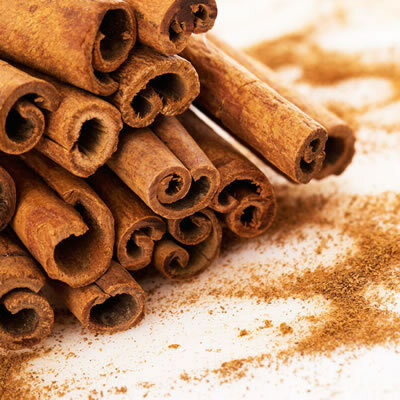 The flavoring component exists in cinnamaldehyde, which is responsible for cinnamon’s distinctive scent and taste. It is also volatile at high temperatures. The flavor can both degrade and evaporate at high heat. This can alter the taste of the baked good. Nabavi, Seyed F.; Di Lorenzo, Arianna; Izadi, Morteza; Sobarzo-Sánchez, Eduardo; Daglia, Maria; Nabavi, Seyed M. 2015. “Antibacterial Effects of Cinnamon: From Farm to Food, Cosmetic and Pharmaceutical Industries.” Nutrients 7, no. 9: 7729-7748. https://www.mdpi.com/2072-6643/7/9/5359. Last accessed 17 October 2018. Ravindran, P. N., et al., editors. Cinnamon and Cassia: The Genus Cinnamomum. CRC, 2004. pp 1, 17-19, 185, 318. Flavours and Fragrances of Plant Origins. CHAPTER 2, Food and Agriculture Organization of the United Nations, 1995, www.fao.org/docrep/v5350e/V5350e04.htm. Last accessed 17 October 2018. Thomas, J., and P. P. Duethi. “Chapter 11.” Handbook of Herbs and Spices, Volume 1, Elsevier, 2001, pp. 143–152. Woodhead Publishing. Gong, Curtis. “Ultrasonic Encapsulation of Cinnamon Flavor to Impart Stability for Baking Applications.” ECommons , Cornell University, May 2018, ecommons-new.library.cornell.edu/bitstream/handle/1813/57370/Gong_Curtis.pdf?sequence=2&isAllowed=y. Kawatra, Pallavi, and Rathai Rajagopalan. “Cinnamon: Mystic Powers of a Minute Ingredient.” Pharmacognosy Research 7.Suppl 1 (2015): S1–S6. PMC. Web. Last accessed 16 October 2018. Kawatra, Pallavi, and Rathai Rajagopalan. Pharmacognosy Research, Medknow Publications & Media Pvt Ltd, June 2015, www.ncbi.nlm.nih.gov/pmc/articles/PMC4466762/table/T1/. Last accessed 16 October 2018. Kring, Lorna. “The Best Ways to Use Cinnamon in Your Cooking.” Foodal, 11 July 2018, foodal.com/knowledge/herbs-spices/sweet-savory-cinnamon/. Last accessed 17 October 2018. “CFR – Code of Federal Regulations Title 21.” Accessdata.fda.gov, United States Food and Drug Administration, www.accessdata.fda.gov/scripts/cdrh/cfdocs/cfcfr/CFRSearch.cfm?fr=182.20. Last accessed 17 October 2018. “CFR – Code of Federal Regulations Title 21.” Accessdata.fda.gov, United States Food and Drug Administration, www.accessdata.fda.gov/scripts/cdrh/cfdocs/cfcfr/cfrsearch.cfm?fr=101.22. Last accessed 17 October 2018. “CFR – Code of Federal Regulations Title 21.” Accessdata.fda.gov, United States Food and Drug Administration, www.accessdata.fda.gov/scripts/cdrh/cfdocs/cfCFR/CFRSearch.cfm?CFRPart=582&showFR=1. Last accessed 17 October 2018.